A new exhibition showcasing the photography of contemporary artists Sarah Conaway, Annette Kelm, and Kim Schoen will debut at the Culver Center of the Arts at UCR ARTSblock on Feb. 24. Much information in our daily lives is consumed through visual cues, like billboards blinking by on a highway, with little time to question authenticity. “Fictive Kin” invites viewers to consider the often-unconscious assumptions we make when looking at photos. Tasked with curating the exhibition, Kathryn Poindexter, exhibition manager and assistant curator at UCR ARTSblock, homed in on how the work of Conaway, Kelm, and Schoen relates both visually and conceptually. Each artist employs photographic tableaux — arrangements in the vein of still life or studio photography — forming a common thread among their work. The work of Conaway, Kelm, and Schoen is also informed in their use of advertising and commercial art. The “fictive kinship,” or the relationship formed by these seemingly disparate works, is reinforced by how each piece calls attention to the ways photos, especially those used in advertising, carry a carefully crafted and subjective meaning. 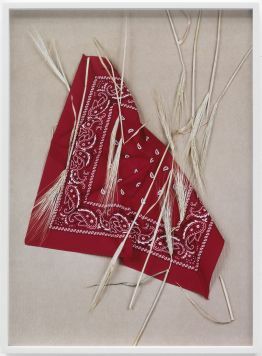 Although playing with similar themes, the artists’ work differs in how they subvert assumptions surrounding commercial imagery, generating unique outcomes. 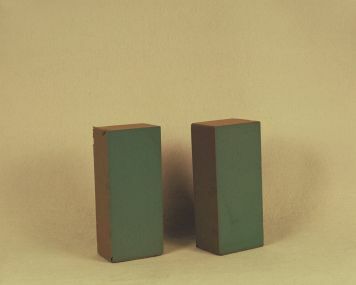 Conaway’s work engages in objectness — a focus in art that explores the specific properties and conditions that make an object what it is — and absurdity, as evidenced by her piece “Forms [Green].” Conaway uses rectangular blocks that mimic the composition found in advertising to create an absurd tension between the seemingly valueless objects and their careful treatment. Kelm exposes how the way a subject is represented drastically affects viewers’ understanding of its meaning. In the companion pieces “Home Home Home / Daylight” and “Home Home Home / Flashlight Dark Shadow,” the former presents a magazine-quality composition uncanny in its kitschy flawlessness. The latter presents the same subject, only this time photographed with high contrast, heavy shadowing, and the revelation of the photographic setup, changing both the mood and meaning of the subject. Schoen plays with language and the ways authority is constructed, and considers how meaning is recognized through accepted visual indicators such as inferring someone’s importance by their attire. Accompanying her photography, a complementary video titled “The Horseshoe Effect” depicts what appears to be an academic lecture from a well-dressed woman. Her confident tone and polished look gives credence to her authority, but it is soon revealed she is spouting only nonsensical phrases. As a whole, “Fictive Kin” asks viewers to reexamine how we assign meaning to the things we see every day, and to consider the source of our assumptions. Guests are invited to attend a walk-through of the show with artist Kim Schoen on March 1 from 6 to 7 p.m., as well as an exhibition reception held in conjunction with this year’s MFA Thesis Exhibition on April 14 from 4 to 6 p.m. “Fictive Kin” will be on display from Feb. 24 through May 6, 2018.